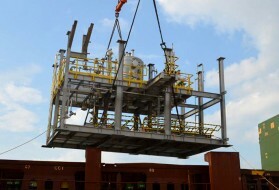 FLS was awarded a freight forwarding contract for the Wasit Project, mono-ethylene glycol plant in Saudi Arabia. 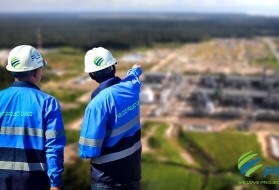 When fully constructed, the MEG Plant, an onshore Greenfield Central Processing Facility (CPF), will be capable of processing 2.5 billion scfd of gas from the Arabiyah/Hasbah offshore fields and produce approximately 1.75 billion scfd of sales gas to meet market needs for local feedstock and support the Saudi Arabian economy. 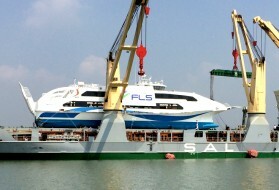 FLS’s scope for this project covers the transportation of skids, pipe racks and other fabricated equipment from a yard in Batam, Indonesia directly to the Wasit site. The break-bulk portion involves 6 separate shipments, amounting to approximately 85,000 freight tonnes, from the Batam yard, which has its own jetty, to Jubail Industrial Port. 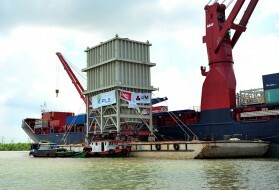 This will be coupled with 200 container loads from Batam to Dammam Port. Additionally, FLS in partnership with its agents in Saudi Arabia, manages the customs clearance and inland transportation of cargo to site, which is more than 60km away from the ports of discharge. The project posed some unique challenges. 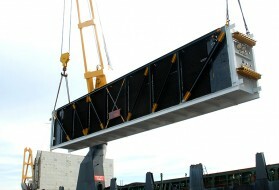 The sizes of the modules transported requires extensive road modifications to the roads from port to site. FLS with its agents worked with relevant authorities to come up with a transport plan that guarantees minimum disruption while ensuring a fast delivery to site. Also the stringent customs regulations in the Kingdom of Saudi Arabia require FLS to work closely with their client as well as receivers to ensure the cargoes are delivered without disruptions. FLS has setup a dedicated team to handle all documentation matters that closely monitors all regulatory requirements.